This is another Recipe Hall of Fame winner and how could it be anything but a winner with a name like Guilty Pleasures? 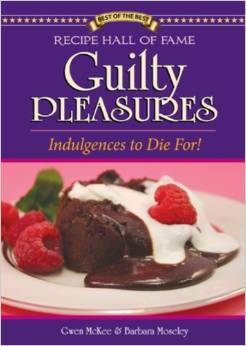 Full of delicious and decadent recipes with easy to understand directions, this book should be used with caution. Tempt your taste buds with recipes like Cherry Chewbilees, Walnut Apple Crisp, Candy Bar Pies, Brickle Bars, Orange Blooms , Praline Crème Brûlée and even Strawberry Lasagna.